David Vincent is a professional voice actor / television producer based in Los Angeles, California. He has lent his voice to a variety of animation / anime and video game titles, as well as numerous national commercials for television and radio. 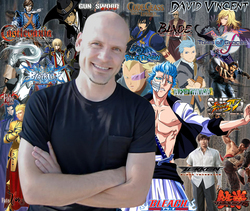 David was nominated "Best Voice Actor in an Anime" by the American Anime Awards for his work in GUN x SWORD. Giichi in Blade of The Immortal. Castlevania: Dracula X Chronicles as Richter. Other titles include HALO 4, Soul Calibur V, Fire Emblem: Awakening, Spec Ops: The line, Alpha Protocol. Many more new titles will be released next year. In addition to voice acting, David has also appeared in front of the camera in guest and co-starring roles on prime time television shows NCIS, Criminal Minds and The Mentalist, among others.